Infantile haemangioma (IH) frequently requires no intervention. Eighty percent of IHs are focal and solitary. 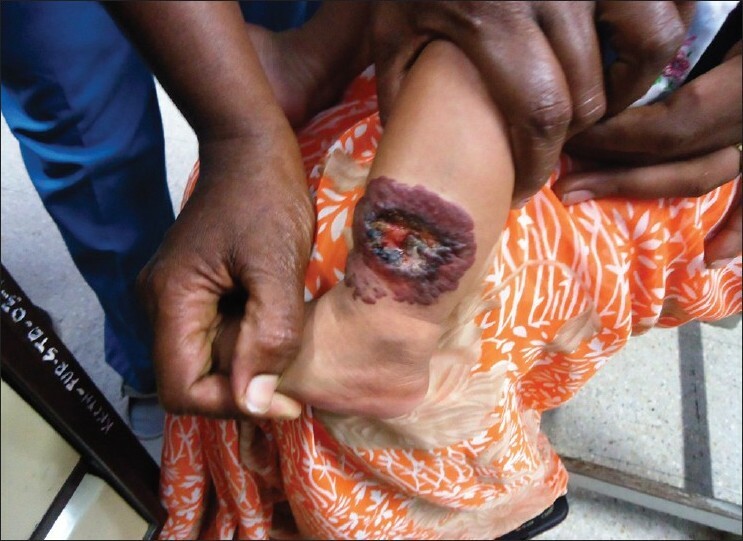 Fifteen percent of cutaneous haemangiomas occur on the extremities. A large size or a specific location or both may carry complications such as ulceration which is one of the main complications, and active treatment is usually required to manage pain, potential scarring, and occasionally, bleeding and infection. Oral propanolol is used in the treatment of IH and is found to be an effective treatment for complicated IH, replacing systemic corticosteroids as first-line therapy. Recommendations for instituting treatment with propranolol in infants differ among different specialties and academic centres. We report an infant with ulcerated IH of leg who responded dramatically to treatment with propranolol in 4 months. Infantile haemangiomas (IHs) are the most common benign vascular tumours of infancy. 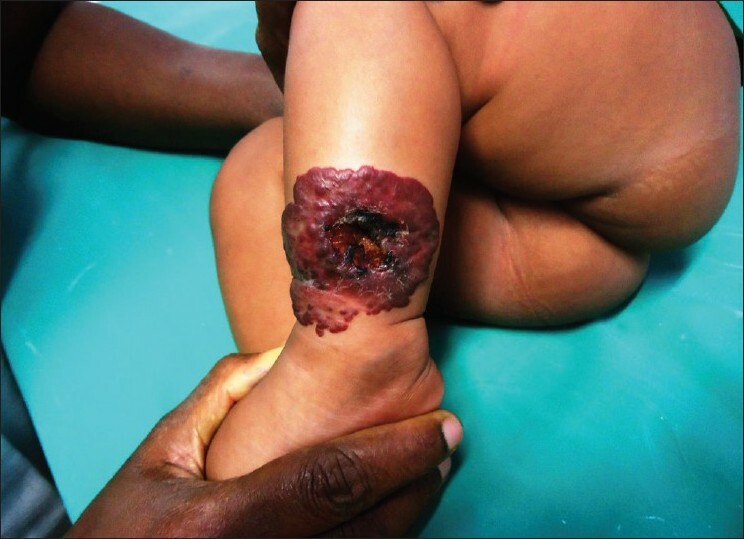 A 4-month-old female child presented with haemangioma since birth, involving the left lower leg near the ankle, with ulceration for the past 2 months. The infant was admitted. After complete evaluation in conjunction with the cardiologist that involved pretreatment cardiac workup and an in-hospital titration of propranolol, the infant was given oral propranolol following the standard treatment protocol. A course of an oral antibiotic was given for a period of 1 week before starting treatment with propranolol. The infant was carefully monitored for systemic side effects. Propranolol was given as an oral liquid (1 mg/mL), at an initial dose of 1 mg/kg daily divided into three equal doses and increased to 2 mg/kg daily after 1 week. The infant was monitored for a 4-h period in hospital after the first dose and 1 week later when the dose was increased. During the 4-h period, the heart rate and blood pressure were monitored every 30 min. For the first 2 weeks, the heart rate and blood pressure were checked twice weekly and thereafter once weekly on a shared-care basis with the paediatric team. The child was admitted for every dose of propranolol. The response was slow till the 12 th week. However, during the subsequent visit, there was a significant reduction in the size with a change in the colour and texture of the lesion. The lesion healed with an atrophic scar at the site of ulceration [Figure 1],[Figure 2],[Figure 3]. Medication was continued for a further period of 2 months and then stopped. The child is being followed up and there has been no recurrence in the past 6 months. Ulcerated haemangiomas are often painful in infants; they incur risk of local or systemic infection and can lead to permanent, unsightly scars. In a retrospective observational study, of ulcerated IHs treated with propranolol, lower limb affection was seen in only 3%. Propranolol is a highly effective and safe new treatment modality for those infants who failed to respond to steroids, and those with complications like ulceration as in our case. However, propranolol is contraindicated and should be used with caution in large haemangiomas. Infants with diffuse (miliary) haemangiomatosis are at risk for high-output cardiac compromise. Infants with a renal or hepatic dysfunction, underlying cardiovascular disease, asthma, diabetes or glaucoma are not ideal for propranolol. The potential side effects like bradycardia, hypotension and hypoglycaemia which can lead to long-term neurologic sequelae should be kept in mind. Ulcerated haemangiomas require treatment independent of their localization or any functional discomfort. The striking effect of propranolol on growing IH can be attributed to three molecular mechanisms: vasoconstriction, inhibition of angiogenesis (reduced expression of vascular endothelial growth factor [VEGF], basic fibroblast growth factor [bFGF], hypoxia inducible factor-1 alpha [fHIF-1amatrix metalloproteinase [MMP]) and induction of apoptosis. They correspond to early (brightening of the haemangioma surface), intermediate (growth arrest; [Figure 2]) and long-term (regression, [Figure 3]) clinical observations. Atenolol is a promising alternative to propranolol for the treatment of haemangiomas as it is less likely to produce pulmonary side effects. Our case confirms the success of therapy with propranolol for ulcerated infantile haemangioma. We found no side-effects with propranolol. Propranolol when used with proper pre-assessment and monitoring appears to be a promising drug in the treatment of even ulcerated haemangioma where steroids may delay wound healing. Propranolol is a highly effective and safe new treatment modality for ulcerated IHs in infants, as in our case. Though ulcerated haemangioma of the leg is rare in infants, it is a cause for morbidity in a growing child. This is probably the first report in India where ulcerated IH on the leg was successfully treated with propranolol. We conclude that amongst the armamentarium of available therapeutic options, propranolol when used with proper monitoring appears to be a promising drug in the treatment of even ulcerated haemangioma. 1. de Graaf M, Breur JM, Raphaël MF, Vos M, Breugem CC, Pasmans SG. Adverse effects of propranolol when used in the treatment of hemangiomas: A case series of 28 infants. J Am Acad Dermatol 2011;65:320-7. 2. Bonifazi E, Colonna V, Mazzotta F, Balducci G, Laforgia N. Propranolol in rapidly growing hemangiomas. Eur J Pediatr Dermatol 2008;18:185-92. 3. Manunza F, Syed S, Laguda B, Linward J, Kennedy H, Gholam K, et al. Propranolol for complicated infantile haemangiomas: A case series of 30 infants. Br J Dermatol 2010; 162:466-8. 4. Saint-Jean M, Léauté-Labrèze C, Mazereeuw-Hautier J, Bodak N, Hamel-Teillac D, Kupfer-Bessaguet I, et al. Propranolol for treatment of ulcerated infantile hemangiomas. J Am Acad Dermatol 2011; 64:827-32. 5. Storch CH, Hoeger PH. Propranolol for infantile haemangiomas: Insights into the molecular mechanisms of action. Br J Dermatol 2010;163:269-74. 6. Raphaël MF, de Graaf M, Breugem CC, Pasmans SG, Breur JM. Atenolol: A promising alternative to propranolol for the treatment of hemangiomas. J Am Acad Dermatol 2011;65:420-1.